The best way to travel around town in Cambodia is by tuk tuk. These tips will help you negotiate the price, stay safe, and get to your destination. The tuk tuk has got to be one of the most pleasant forms of intraurban transit in Cambodia. The official name for them is the French word remorque, but everyone still calls them tuk tuks. These two-wheeled carriages pulled behind a moto are a breezy way to travel and are marginally safer than going by moto–mostly because they go at about half the speed. 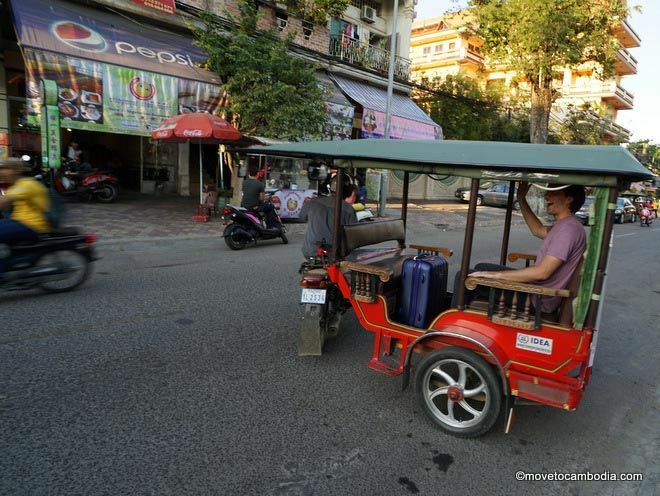 Taking a tuk tuk is one of the best ways to get around Cambodia in style. 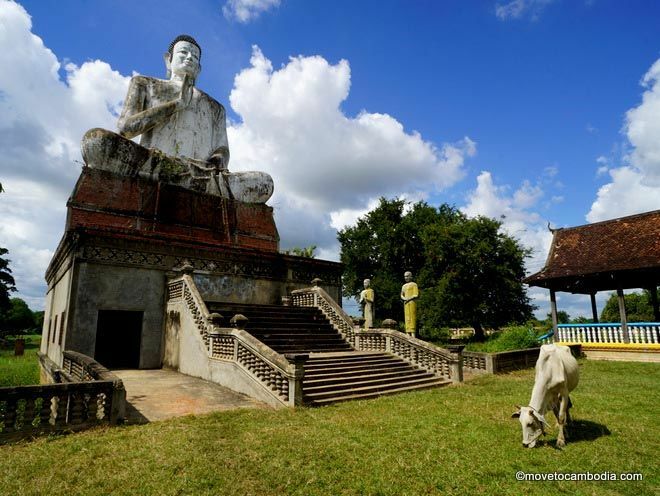 Learn the pagodas and markets. Most tuk tuk drivers seem to have only a loose grasp of the geography of the area they work in and are not familiar with the sort of landmarks that Westerners generally use. For example, telling a tuk tuk driver a street name and cross street will often result in a blank stare. But tuk tuk drivers will almost always know the names of the local markets and pagodas (wats), so it’s good to know which one you live closest to and give directions from there. Negotiate the price in advance. When tuk tuk drivers see foreigners, they often see dollar signs floating over our heads. Therefore, it’s better to negotiate a price in advance rather than risk having an argument about $2 in front of your house or the restaurant where you’re having a business dinner. Negotiating a price in advance gives you the leverage to walk away if you don’t think you’re being offered a fair deal (and walking away usually drops the price substantially). Once you have a relationship with a regular driver, you can do as the locals do, and just pay what you think is fair at the end of the trip. Prices (for Phnom Penh): Everyone pays different rates (some people seem to be able to negotiate lower rates and others seem to always pay more) but here are some tips to get you started. Prices never go below $1. A trip that’s up to 5 minutes is usually about 4,000-6,000 riel ($1 – $1.50). Across town is usually $3 and anything in between a short trip and an across town trip is $1.50 to $2. From almost anywhere in Phnom Penh to the airport should be $6, but it can be gotten for $5 if there’s not a lot of traffic. If you make your driver wait for you or he helps you carry your groceries upstairs, pay a bit extra (depending on how high up you live!) Also expect to pay slightly more at night and you will always pay more the more people you have. A trip that will cost $1.50 for 1 person will be $2 for 2-3 people and even more if you have 4. It’s important to remember that prices have gone up recently (as of 2014) because Cambodia has experienced inflation and rising gas prices. Do not expect to pay the same rates you paid five years ago. Prices outside of the capital are similar, although sometimes a bit higher due to limited supply. Negotiate in Khmer. This will almost always get you a better price. Remember, there are three levels of pricing in Cambodia: tourist, expat, and local. Knowing some basic Khmer will move you into the second category, at least. When you’re new in town you’ll almost always get the tourist price until you learn what a fair price is and how to bargain in Khmer. If you’re offered a price that’s too high, whine and say “T’lai na!” (“So expensive!”). Usually you’ll be offered a better deal. Don’t go too low. If you’ve offered a price a few times and started to walk away and the tuk tuk driver doesn’t bite, you’re probably not offering enough. Tourists and new expats often start out by paying too much, and then overreact by trying to bargain down to a price that’s much lower than what’s really fair. Remember, the price of gasoline is almost certainly higher here than it is where you’re from, so offering $1 for a ride all the way across town isn’t realistic. 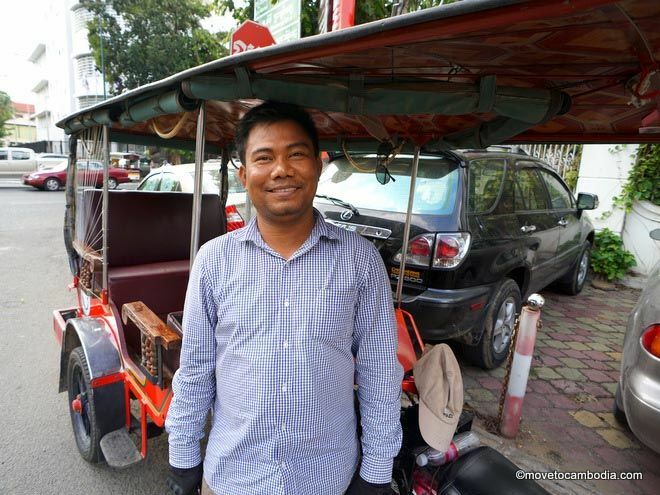 Learning to negotiate and give directions in Khmer will make your tuk tuk rides in Cambodia a million times easier. Scope out the drivers. Tuk tuk drivers who hang outside of hotels, bars, and clubs or speak English usually charge more than those who don’t. Tuk tuk drivers who are on the move usually charge less than those who are sitting around waiting for a fare. 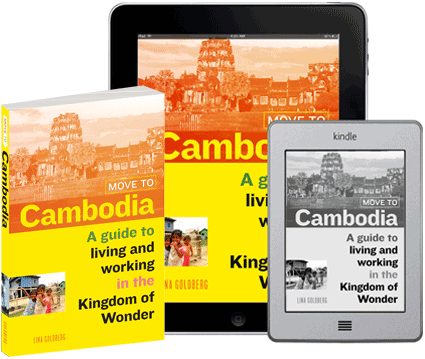 Get a map and learn to give directions in Khmer. This is perhaps the most crucial tip of all. Despite being transportation professionals, most tuk tuk drivers have no idea where your destination is, even if they tell you that they know. Expecting them to find it is usually an exercise in futility that will result in higher fares; after they get lost for 30 minutes they’ll expect you to pay for the gas they expended driving in circles. You can find free Canby guides and maps in most of the tourist hotels and hot spots. Carry one with you when you travel, but don’t expect drivers to be able to read it, since many are map-illiterate. Instead, learn the Khmer words for simple directions, which will help make your trip go more smoothly. Stay safe. If you are in the back of a tuk tuk, you are at increased risk of having your bag snatched by young men on motos who make a sport of it. Make sure to hold your bag close to you, or keep it under your feet. Be alert when riding in tuk tuks. Those who who idly play with their expensive smartphones often find their expensive smartphones snatched out of their hands. Then they will probably wish they had signed up for travel insurance before coming to Cambodia.